Iceland landscape photography is such fun and nice to work with. When one photographs a landscape with beautiful lakes that are full of fish and mountains that stand so dignified a good framing gives the image something extra. 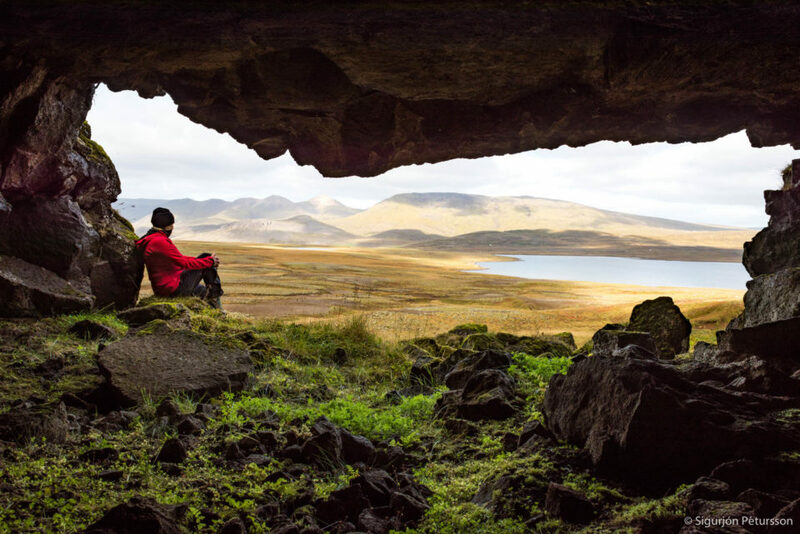 In this landscape photography, we were in a cave outside Reykjavik looking at the mountains in front of us. The photographer was sitting on a rock as far inside as was possible. I sat down in my red jacket in the entrance to give the image some color. Using the cave entrance to frame the picture was in our mind just great. How do you like the framing? Travelers and outlaws have for centuries used Guðnahellir as shelter from the snow and cold weather. It is on the road that leads from the southwest coast to Þingvellir. Þingvellir was for more than 850 years the place for our parliament. Therefore people traveled all over Iceland to gather there when the parliament was in session. How this photo was taken? Nikon D810, with a 24-70 mm f/2,8 Nikkor lens. ISO 100, f/22, 1/30 sec, and tripod. Iceland – Greenland Photo Tour, Greenland, and Iceland are so close to each other. It takes you only 90 minutes to get you from Iceland to Greenland by plane. Sigurjón and I have traveled a lot. Both two together and with other people. There was a time that we were offered to join a few men that were going on a sailboat in Greenland, or Scoresby Sound to be more exact. The trip was going to take a week on the boat so of course, we jumped at this opportunity. Knowing that they were very athletic and outdoors type of people. At the airport here in Iceland we met the group and together we went to Greenland. In Greenland, we met our guide (unusual for us) a wonderful young Icelandic man. Donna was the name of the sailboat. The crew was wonderful and everything was just perfect, to say the least. We spent a wonderful week photographing everything we saw when sailing. We went kayaking, hiking and swimming in the sea. Because the other members of the group were brave enough to do that we could photograph them every day as they were swimming. Scoresby Sound is a large fjord system of the Greenland Sea on the eastern coast of Greenland. It has a tree-like structure, with the main body approximately 110 km long that branches into a system of fjords covering an area of about 38,000 km2 (14,700 sq mi). The longest of the fjords extends 340–350 km inland from the coastline. It is one of the largest fjords in the world. On the northern side of the mouth of the Scoresby Sund stands Ittoqqortoormiit, the only permanent settlement in the region, with a population of 469 (in 2010). The name of the sound honors English explorer William Scoresby, who in 1822 mapped the fjord area in detail. Iceland – Greenland – Photo Tour the trip of a lifetime. The Scoresby Sound fjord system is truly every photographer’s dream. 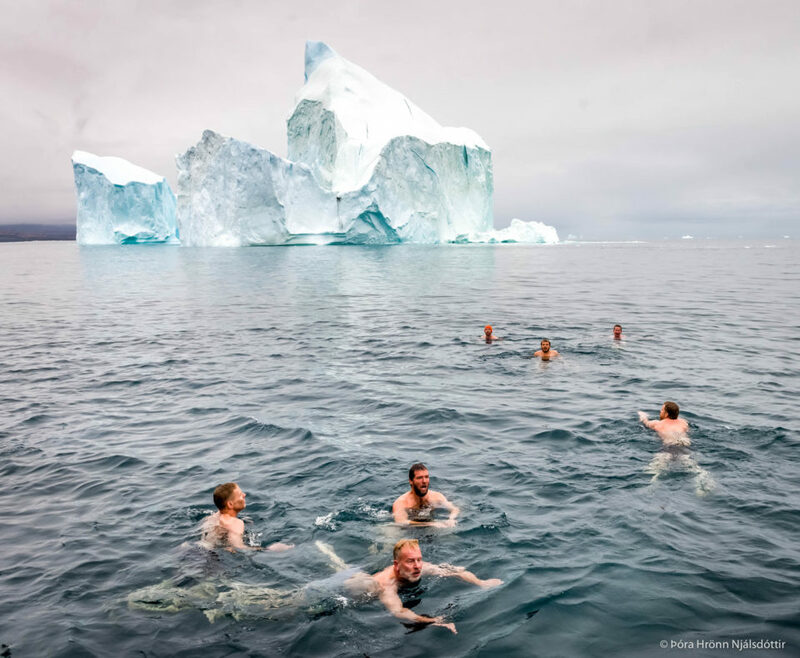 The fjord is filled with beautiful icebergs in all sizes and shapes. On land, you have an unusually rich fauna for Greenland like muskox, stoat, mountain hare, lemmings, and polar bears. In the sea seals and whales. Among them the narwhal. The size, shapes, and colors of the mountains and glaciers are second to none. 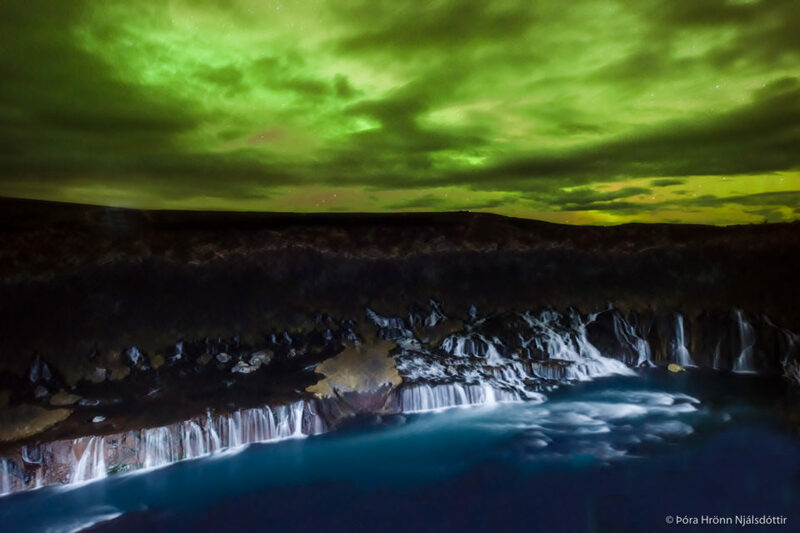 Photo Tours in Iceland can take you there. Iceland – Greenland – Photo Tour. Nikon D810 with a Nikkor 24-70 mm/f:2.8 at 28mm. ISO 400, f:8.0, shutter speed 1/320 sec. Photography Trip Iceland is a unique experience. One of our private exclusive tours is the Snaefellsnes Photo Tour. There are so many extraordinary places to visit. One of the most popular places to photograph is on the south coast of the Snæfellsnes Peninsula. You will find The Black Church or Búðakirkja there. Photographers from all over the world come to photograph it. On our private tours, we stay there as long as it takes to get the weather and light right. People come from all over the world to the Búðir church for their weddings, to celebrate anniversary or birthdays. A top class hotel is close to the church, with beautiful rooms and the food is excellent. It is not a big hotel but exclusive. This 90-km long peninsula comprises a world of diversity for a successful Photography Trip Iceland. Friendly towns and villages, spectacular mountains, a multitude of bird species nesting on treacherous cliffs, beaches of sand and pebbles popular among horsemen and rock skimmers, remnants and relics scattered here and there of times and ways of life long past. Saga sites and hiking trails. 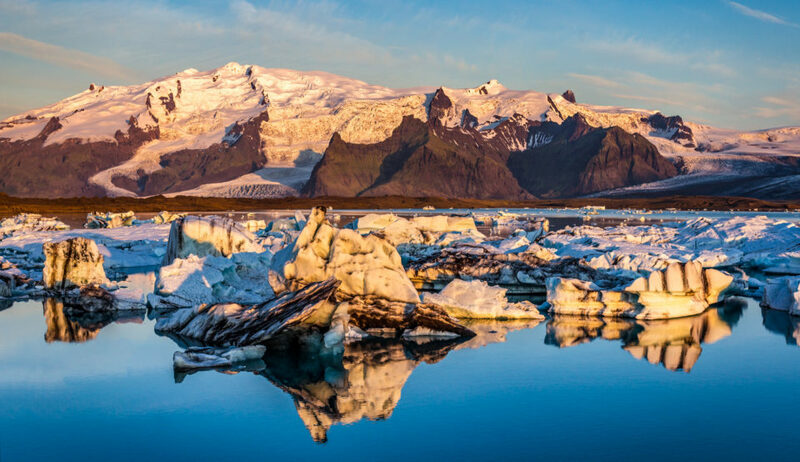 The Snaefellsjokull National Park is at the westernmost part of the peninsula, including the mystical glacier Snaefellsjokull, as well as other unique sites such as Djupalonssandur, Thufubjarg and more. 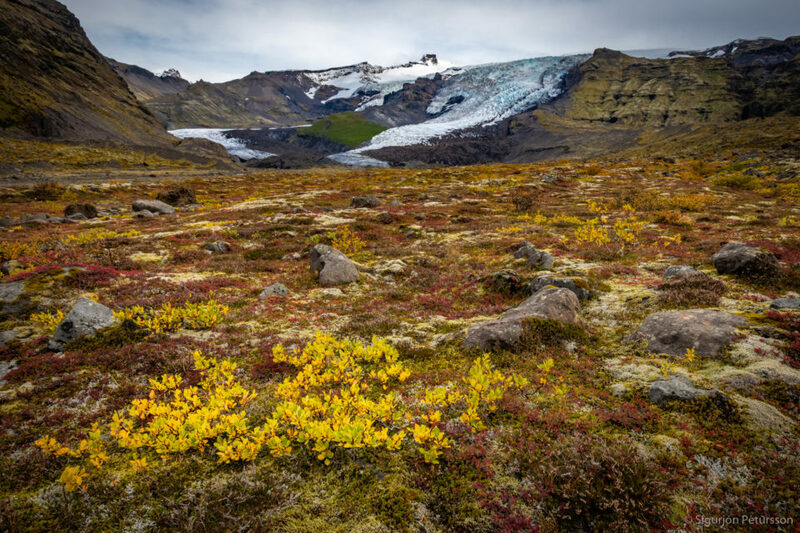 In 2008, the communities of Snaefellsnes Peninsula were the first in Europe to receive certification from Green Globe, an international benchmarking system for sustainable travel and tourism. 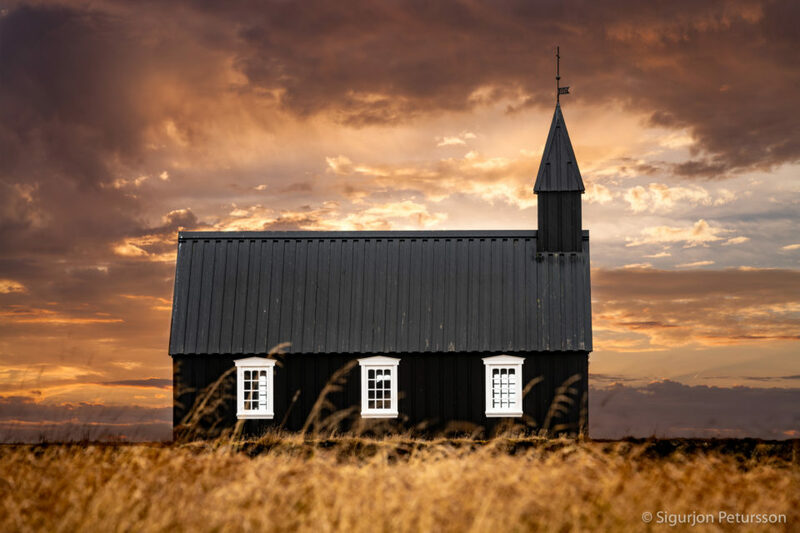 This photo was taken on a Photography Trip Iceland in the autumn as can be seen on the grass in front of the church. The sky had a dark color but as we waited it started to brighten up. In our opinion, the church is beautiful and simple. Nikon D850, Nikkor 70-200 f:2.8 at 170mm, f:8.0, ISO 100, shutter 1/8 sec, and a tripod. Looking at this picture from Víkurfjara shore, South Iceland made me think of how good last year was for us. Starting a new year is always something special. After holidays with friends and family, one is really looking forward and ready to start the new year. Maybe making some promises to yourself to be a better person, a better photographer, a better salesperson and other things you would like to improve. Not forgetting the promises to widen our horizon and visit other countries. When this picture was taken we were doing a photography tour along the south coast of Iceland with an extremely nice couple from the USA. They were not young in years but they were so young in spirit and willing to explore and see new things. For us, it was so gratifying being with them. We were not that lucky with the weather as it rained a lot but the light was with us. That is really what counts when photographing. The beach Víkurfjara on the south coast of Iceland by the village of Vík is a sight to see. One always has to be careful though as the waves can be very strong and dangerous. 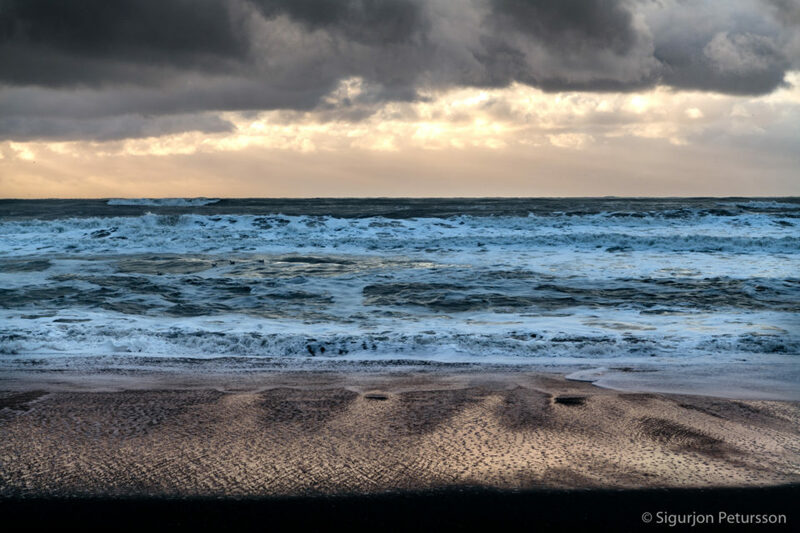 As the picture from Víkurfjara (FJARA in Icelandic means BEACH) shows, the waves were big and the sky was dark, but the light on the sand was unbelievable. I would say that the light in Iceland makes it so interesting for photography. Of course, it has also to with other things. On private tours as ours, we can take as much time as we like at each location. Anyway, here we started shooting and the outcome was rather good. The weather was rather windy and the clouds were nice. It had been raining so we had been waiting for a while. But once it stopped we went out of the car and started shooting our photos of Iceland beaches. Nikon D850, Nikkor 24-70 mm f/2,8 lens at 24mm f/11, ISO 100, shutter speed 1/400 sec, and handheld. Happy Holidays and Happy New Year dear friends to you all around the world. This picture is taken in Akureyri which is the biggest city in northern Iceland. The church is a Protestant Lutheran church. The building is located in the center of the city and towers above it up on a hill. The steps leading up to its front door are about one hundred. The architect was Guðjón Samúelsson and the church was completed in 1940. The old stained glass window above the altar is a part of a set which was destroyed in an air raid on Coventry Cathedral in England. The picture shows you how we celebrate the new year. 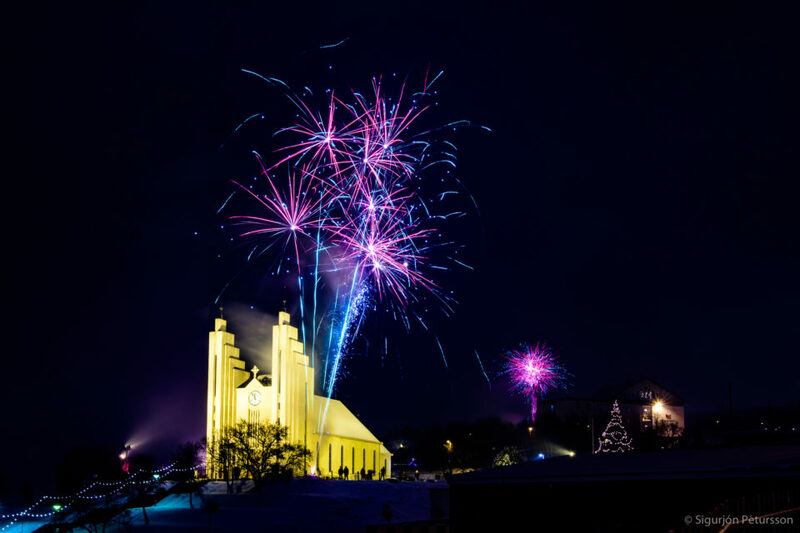 It is a custom in Iceland to fire a lot of fireworks just before the beginning of the new year. We were with our family in Akureyri and just around midnight everything was in full swing. The sky was lit with fireworks, all in such beautiful colors. Afterward, we wished our family Happy Holidays and a Happy New Year, took a glass of champagne and made a toast (SKÁL in Icelandic) to the New Year. At this time of the year, we tend to look back and think about all the things that have happened in the last twelve months. We also make promises to ourselves to make the next year more prosperous. We have a bottle that keeps written notes from the year before. Everybody has made him or herself a promise what to do in the coming year. So after breaking the bottle we read it aloud and see what we have done. Then we take a new bottle, write our promises and goals for the new year down and put them in the bottle. It is a nice tradition. We have traveled a lot, met a lot of friends and also made new connections. We have been to places like Namibia, South Africa, new towns in Greenland, Sweden, Poland and a lot of new places as we bicycled from Key West, Florida to New York City in the USA. Last but not least we have taken tons of pictures that will preserve all these precious moments and memories. We now look forward to days that lie ahead of us with our family here in Iceland. Again we will all come together in the north during the last days of this year. Akureyri here we come with our skis and good humor. We wish all of you our friends in our Social Media Cosmos and around the world a Happy Holidays Happy New Year. We hope we will see you in Iceland the year 2019. The picture was taken with a Nikon D850 with a 17-35 mm f/2.8 Nikkor lens at 26 mm. ISO 125, Aperture f/22, 8 sec, with a Really Right Stuff tripod. Here you can see a beautiful picture of a waterfall on the south coast of Iceland. 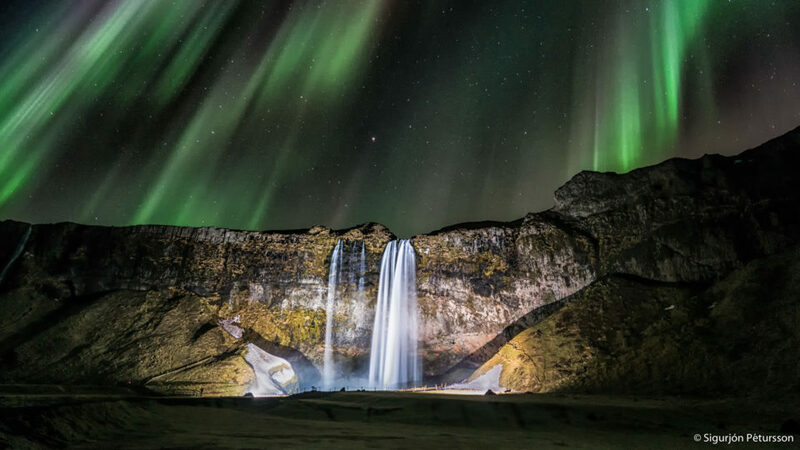 Additionally, you see the Seljalandsfoss waterfall Iceland surrounded by the magnificent northern lights. The Icelandic term for the waterfall is Foss. Seljalandsfoss waterfall is very close to the Ring Road. Therefore it is possible to take a day tour to see the waterfall and others that are close by. The waterfall is very picturesque and fairly easy to get to. As this is a waterfall we advise you to have a raincoat on as the waterfall sprays a lot and people get wet. It can add to the fun if you are just looking, but for the cameras, it is not so good. Usually, we have a lot of people there, but if you are willing to wait you usually end up with a lot of fewer people. And in some cases, people add a lot to the picture. We are a small company offering only private tours so we plan our tours just according to what we and our customers like to do, and also as long as we like. The Bridge between two continents is one of the sites you will see when visiting Iceland. When traveling and photographing with us the owners and operators of Photo Tours you will see a lot. You will see and discover a lot of amazing sites. The Bridge Between two Continents is one of them. You will find this attraction on the Reykjanes peninsula. It is not far from Keflavík international airport. The bridge is a short footbridge 15 meters long that crosses a sand-filled fissure and connects two tectonic plates i.e. The North American and the Eurasian tectonic plates. The bridge was built as a symbol of the connection between Europe and America. The fissure clearly shows how the Eurasian tectonic plate and the North American tectonic plate are gliding apart by two cm each year. At a recent trip to the Reykjanes Peninsula, we sure had fun photographing. Can you imagine holding the bridge with your bare hands, and all the people on it, even if it is only symbolically? 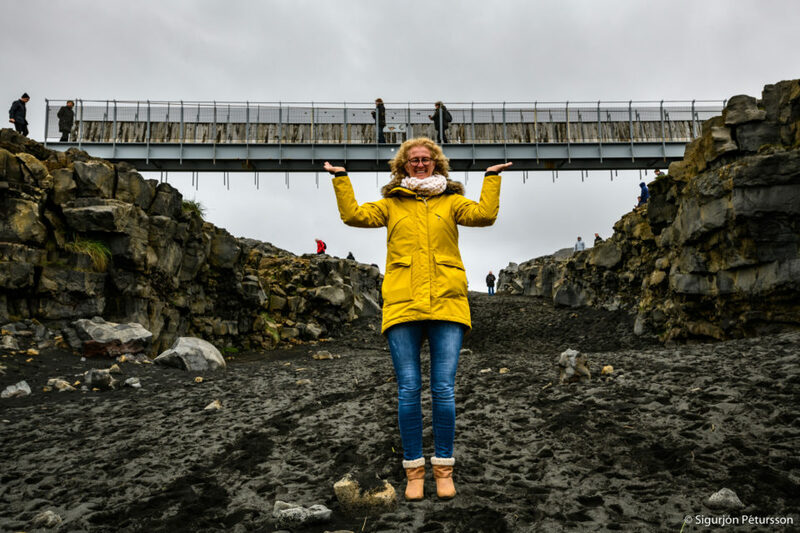 Iceland is located right on top of the meeting point of these two tectonic plates The bridge between two continents. The country itself is full of large fissures and canyons that scar the country alongside the edges of the tectonic plates. The plates are constantly edging apart, creating both earthquakes as well as volcanic activity, and this increases Iceland’s size by about two cm each year. We urge our visitors to cross the bridge between two continents and walk from Europe to North America in a matter of a few seconds. Only symbolically though, as the meeting point of the two tectonic plates is not that small in size. This image was taken on a day tour to the Reykjanes Peninsula. The bridge between two continents was among other interesting places. Nikon D850, f/14, 1/200 sec, ISO 200, Nikkor 17-35 mm f/2,8 at 32 mm. Iceland fall colors glacier, and other things were very much in my thoughts yesterday. First of all the weather was so very cold and beautiful, therefore the air was clear and fresh. Iceland showed it best face. But Iceland was cold, and all the fall colors had disappeared. One could feel that winter has arrived. Actually, yesterday was “The First Day of Winter” according to the Icelandic calendar. I was thinking where we were about one month ago. We were at a glacier, Icelandic name “Virkisjökull”. People were walking with crampons on the glacier, looking at the beautiful fall colors all around them. We and our people were more at the bottom with all the beautiful Icelandic Flora. Our cameras were working overtime because where ever we looked there were more and more fall colors. And do not forget the glacier. All around us were Iceland fall colors glacier are more spectacular than the one we were looking at. There were always more to photograph. The light was beautiful, the sun was shining on the glacier, not too much though. All the tourists that were going on a hike had a merry look on their faces. Obviously, Iceland gets a lot of tourists, which is good. Everybody wants to have a nice holiday. On our t0urs, we try to include all the most interesting places there are to be found in Iceland. Fall colors fall into that category. To see a glacier up close, and even walk on it is a highlight not to be missed. At the same time, we should pay respect to nature. Iceland being up by the Arctic Circle has very sensitive flora. In Iceland, you are in the Tundra Zone. Therefore we must keep to marked trails and not leave footprints off trails as these take years to recuperate. “Take nothing but pictures. Leave nothing but footprints om trails. Do not go off trail. Kill nothing but time” Let us all bear that in mind and live up to it. 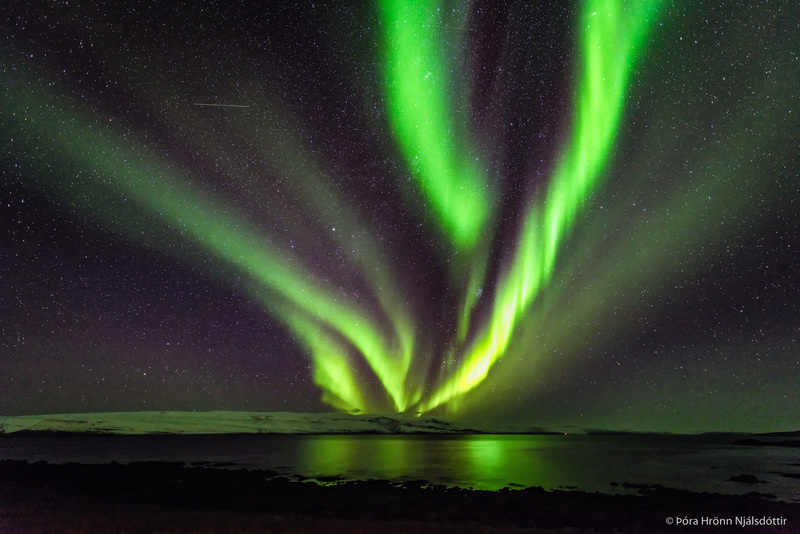 Northern Lights in our Photography Tours Iceland is our baby these days www.phototoursiniceland.com of which we are very proud of. We love to show people around our country and point out interesting sites. We have a good knowledge of the best photography spots and also a good knowledge of our Sagas and history. On our private photography tours Iceland, we are always anxious if/or when the Northern Lights or Aurora Borealis as they are also called will show up. They are something like a “lifetime dream” as a friend of ours wrote this morning on Facebook when posting her first beautiful picture of the lights she has ever taken in her life. It is rewarding to be with people when the lights appear. The Lights are there but can be covered with clouds so nobody sees them. Last night was extremely good for an hour or so. We were not expecting anything as the forecast was rather low. We checked them for the last time before going to bed. Actually, we had told our customers that we had it for the night. The lights were very poor only about 2 out of 9. So we almost ignored it. We called our people and told them to grasp their cameras and get in the car. We as group leaders for private photography tours Iceland, could not stop smiling. They showed up and danced for us all over. Our people were very happy as well. The picture of the Northern Lights you see here is taken at f:/2,8, shutter speed 13″, ISO 800 and exposure compensation +2.0, post processed in Lightroom. When taking pictures of the Northern Lights you always have your aperture at the smallest number, but it varies with the shutter speed and ISO. Namibia Photo Tour has been on our bucket list for a long time. The opportunity came to this summer and we decided to go with our daughter and son in law. What a pleasure and what a wildlife site. We packed our cameras and equipment and traveled there from Iceland. It is a long flight but airports are always nice because you can take a lot of pictures on your iPhone. Which by the way is always in your hand. Photo Touring in Namibia is a box full of chocolate for your senses. Think of wildlife instead of the chocolate. Springbok, for example, is an amazing sight. Beautiful delicate creatures that move like ballerinas hardly touching the ground. The magnificent elephants that walk so gracefully into the sunset, the giraffes so tall and graceful biting the trees, the birds and all the other animals. Namibia sure is a heaven for us photographers. Namibia is a landscape photographer’s paradise. 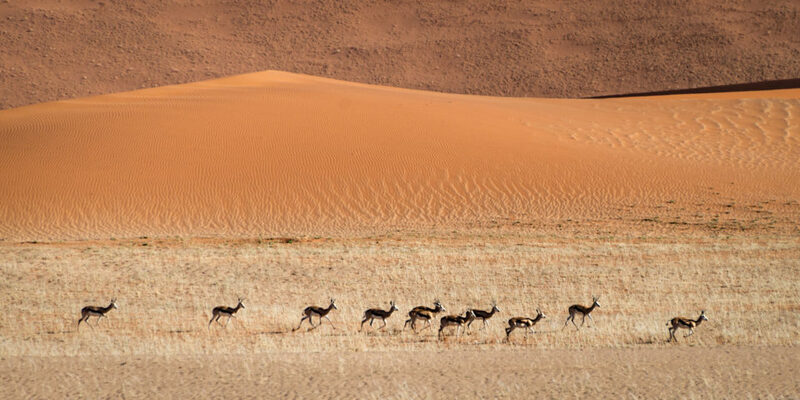 Namibia’s allure is its vastness, the feeling that you can get away from it all in this enchanting, desolate landscape. You do not have the overcrowded feel that you sometimes in other places nowadays. There is something special about photographing in nature when there is no one else in sight. Namibia offers this unique experience. Namibia’s dedication to the conservation of its wildlife, its diversity in landscapes and that fact that it is one of the safest environments for travel of any African country, are a few of the great attributes that make Namibia an incredible playground for photographers. Nikon D600, Nikkor 28-300mm at 300mm, ISO 400, f/5,6, shutter speed 1/2000 sec.